I have had the good fortune to live in three of the world's greatest cities, New York, Washington DC and Paris. Each has it's own distinctive look and personality. I love all three. My life in Paris was many years ago and I find I am too far removed to paint it from memory and don't feel right creating work from old photos. I would need to visit and renew my relationship with the city before painting it. However, New York and Washington are a different story. 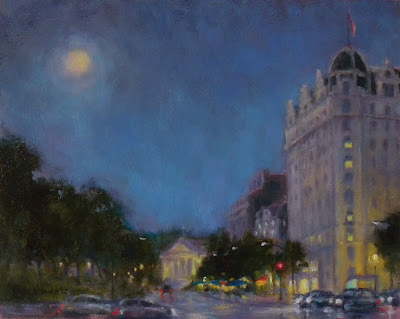 I have been living in Washington DC since 1974 and it is the city I paint most often because I am right here. This is now my hometown but it is not the first city I called home. I grew up in Northern New Jersey just a 20 minute drive from NYC. We were the only family members NOT living in New York and I was considered the "country cousin". I am sure I traveled over the George Washington Bridge over a thousand times between family visits, good times in the city with friends, shopping trips and later working there. I still feel like I am going home when I visit.. Therefore it is with familiarity that I can paint that city. The painting above which I have titled "Splash" is a painting of 8th Avenue in the upper 50's. For those not familiar with NYC that description means it is on the West Side and upper 50's refers to the cross streets between 55th and 59th streets. New York is drawn on a grid. I used to live on West 61st Street and this view is what I saw when I walked from my apartment down 8th Avenue to 57th Street where I used to visit some of my favorite galleries. 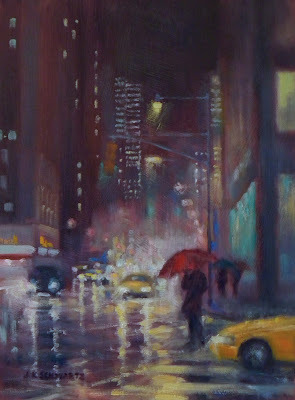 Rain, particularly at night really makes the city sparkle and so I decided to make that the subject on this familiar stretch of the city. AUCTION UPDATE; "When the Clouds Parted" sold at auction at the Salmagundi Club this afternoon! Knowing there would be at least two small works shows I would be entering this fall I did a number of small paintings this summer in preparation. This one is a particular favorite as it was a lovely summer night and the full moon and romantic lights from the Willard and Cafe du Parc in front of it lent a fairy tale feeling to the scene. The view is from the edge of Freedom Plaza on 14th street. The fountain was not on so I had a clear view over to the hotel. This is not a plein air painting. It was developed by making a sketch of the scene during the daylight hours and then adding the lights and sky I experienced at night. As you can tell by now, I like to paint cityscapes. I think that cities look their best when lots of lights are on. That is why so many of my paintings are rainy day or evening/night paintings. Early morning can be beautiful as well but I really like the twinkle factor of the other end of the day. This little one was sketched plein air from one of the pedestrian bridges over the canal looking back toward Wisconsin Avenue. Since the star of this scene is the canal I decided to eliminate the traffic that is always pretty heavy on Wisconsin Avenue in Georgetown. I had just had dinner at Filomena which is a well known Italian restaurant in Georgetown and is in that white building on the left. 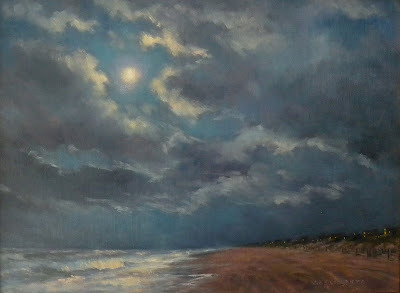 SALMAGUNDI AUCTION UPDATE: "Mainland Lights" from my last post SOLD at auction on Friday night. "When the Clouds Parted" will be auctioned this coming Sunday, October 18th at 2:00 P.M.
You can go to www.liveauctioneers.com to see all the artwork available. My painting is lot #63. I can tell you that if you have any interest in owning one of my paintings this is the most economical way to acquire one. Just create a free account at the above link and place a bid online or by phone or live during the auction. You can also go to www.salmagundi.org and get instructions for bidding there. I do this twice a year as it is a fundraiser for the Salmagundi Club. I accept the fact that the paintings sell well below market value but I believe in supporting this institution and I also consider it great publicity. Where else is a guy in a tux going to stand there holding one of my paintings and talk about me, my affiliations, my gallery representation and the virtues of my work :-) I consider it a win all way around, for the Club, the collector and for me! The much anticipated 2015 Fall Auction Exhibit is now on view in the Main Gallery at the Salmagundi Club, 47 5th Avenue, NYC. This is a twice annual tradition of the Club and is our major fundraiser. I really enjoy having my paintings accepted for these auctions. The exhibit is on view now through October 24th and there will be three live auctions. I am just participating in the first two this year. Please go to www.salmagundi.org to view all the works in this show and see what the minimum bids are. When you are on the main page click on the 2015 Auctions. You will then receive instructions on bidding and when you click "Here" you will go to the paintings. Mine are on pages 14 and 15. What is really fun is to create a free account at www.liveauctioneers.com which requires only a user name and password and then you can see all the work, place bids right there online and even watch the auctions live at the Club. Both of my paintings have an opening bid of only $400! I do hope you tune in!